Taking it one day, one sastrugi, at a time. The Twin Otter pilots dropped Carl Alvey’s team medical supplies for 40 days. Henry Worsley entered the forewarned notorious sastrugi fields in 87 degrees South. 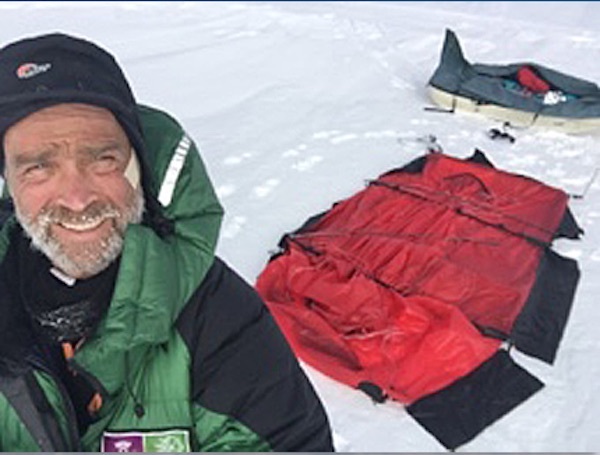 HENRY WORSLEY UK solo, Unassisted Unsupported traverse 1100nm / 2037km, Berkner Island – Geographic South Pole – Shackleton Glacier (Ross Ice Shelf), Started November 13, 2015. Good weather conditions, “a blessing”. Henry is losing weight, and said he is not as strong as he was at the start. He entered the brutal sastrugi fields of 87 degrees. The rock hard ice formations are non-stop packed and feet apart. Key is, not to be over phased by the scale and distance involved, said Henry. “I have to accept it and keep moving. 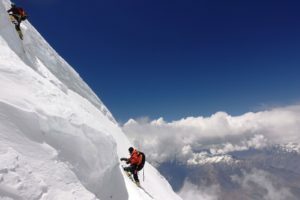 There is obviously nothing I can do about it.” He focuses on one ridge at a time, which made for lower miles. Another 70 miles of these to cover. His body needed urgent rest and a couple of anti-inflammatories. Distances: 13.9nm, 14.nm (“only .2 more, but to me, at this stage, it matters”), 0nm (rest day), 17.1 nm, 14.1nm (12 hour days), 12.7nm. LUKE ROBERTSON UK/Scotland, solo, Unassisted Unsupported 1130km, Hercules Inlet to Geographic South Pole, Started December 5, 2015. Luke’s solar panels are not working, reported his home team. He has a backup power source which is pretty slow to charge so can receive messages but not reply or send updates. Whiteout conditions all of today too, but means no scenery to stand around and gawp at! DOUG TUMMINELLO USA solo, Unassisted Unsupported 1130km, Hercules Inlet – Geographic South Pole, Started December 6, 2015, at 7 pm, skiing for an hour. Doug covered 8 to 11 nautical miles in 9 to 11 hour days. 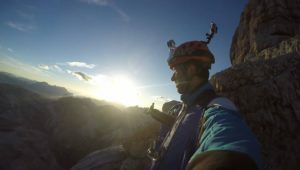 MICHELE PONTRANDOLFO (Italy) solo, Unassisted Kite-supported, traverse: Coast at Novolazarevskaya – Geographic South Pole – Hercules Inlet, Started November 19, 2015. During the past few days, Michele got favorable kiting winds and covered 27km, 0km, 61,52km 71km and 59km. He is still traveling uphill and encountered sastrugi, which made him fell over a few times while kiting. Temperatures range from -22ºC to -34ºC. He completed his ski, kite and climb solo trip in QML. CARL ALVEY (UK, ANI guide), EMMA TAMSIN KELTY (UK), Assisted (resupplies) Unsupported 1130km, Hercules Inlet – Geographic South Pole, Started December 5, 2015. Emma is battling it out there, “This soft snow is really taking its toll. It’s like heavy cross-country skiing off piste pulling a snow plough behind….. For 7 hours a day plus 70 min break (10min break every 50 min) a day. As a pair, slowing up or stopping mid flow is difficult/ frustrating and in short timings are not flexible. So today was the day that I started to ski 1.2nm per hour …. Every lift of the ski to get over the next bump, snow pile or whatever it maybe (cause today there wasn’t any definition again) required masses of effort. So I called it a day…. After 2 hours of skiing, today [Dec 20]. On the 19th, ANI dropped them spare Norwegian bindings and 40 days worth of cream and dressings for Emma’s polar thigh [frostbite on upper legs]. Devon’s team had a bird fly by, which is a rare experience. The Pensacola Mountains came into view, in a distance. White-out made way for wind. They stayed clear of a big crevasse field. Every day they keep the same routine of starting at 9 am, ski for an hour, rest ten minutes, until 5:15 pm, reported Mostafa. The men take turns to navigate every hour. The team reported that they are heading for a cache with food supplies. Before the expedition they told Explorersweb they will not have food caches (resupplies) along the way. Seems they have changed their mind. There are three waypoints where ANI keeps the caches with resupplies for the resupply teams, as well as some emergency supplies for unassisted teams, in case they need it.